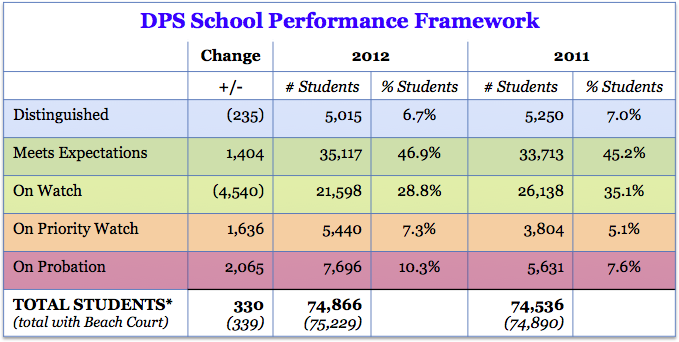 Denver Public Schools has released its 2012 School Performance Framework (SPF) (although it’s not yet on the website). There is a lot of data, but I find there is a useful shorthand to compare progress. For when you look at the data from this year to last, also compare this year’s press release with last year’s press release. If the numbers to which an organization is drawing attention shift — and particularly if there was something highlighted last year that is suddenly absent this year, there is probably a certain amount of spin. The number of students is about the same — an increase of 330 (and note these do not count AECs), and I have also included the percentage of total students in each category. Is there some spin here? The second piece of hard data in the 2011 press release stressed the increase in the number of schools in the top rating category (“distinguished” or blue), a statistic which the 2012 release does not mention. Well, in the past year, the number of blue schools grew from 14 to 15 (provided you remove Beach Court from the 2011 total). And this includes splitting the DSST 6-12 campuses into separate middle and high schools, which is a new policy. So the number of blue schools is essentially flat and a little opaque. Far better is to look at the numbers of students in blue schools — which declined in 2012 (and if you include Beach Court, they would have fallen even further). Several of the best new schools are in their initial years of operation and are growing one grade at a time (there are two DSST campuses and High-Tech Early College which have between them just 381 students). Perhaps these will sustain their performance as they grow, but it’s not a given (and several formerly distinguished schools dropped lower in the ratings as their enrollment grew). So one might understand the shift in emphasis between press releases. For the 2012 release prefers instead to focus on the increase in the number of schools at the top two levels (blue and green). And the number of students in these two categories has grown somewhat impressively, by 1,169 students (or 1.6% of total students). But this increase is manly reflective of having more students at the bottom of a large range than at the top. The green “meets expectations” band covers schools with scores from 51 to 79. On the 2012 SPF there are 6,067 students in schools at the top of the band (with scores between 70-79), while 13,253 — or over twice as many — in schools at the bottom of the band (scores between 51-60). In other words, everybody passes, but with a lot more “D’s” than “B’s”. And an increase in D’s is an odd foundation on which to claim improvement, particularly when the number of students in distinguished schools has declined as well. The bar for getting into this larger group is quite low, and there is a very big difference in quality between the bottom and the top in what is essentially the 50-point range that encompasses all blue and green schools. Should each of these schools count the same? DPS seems to think so. What is even more revealing is that the 2011 press releases also emphasized, with its own devoted paragraph, a decline in the number of schools in the bottom category (“on probation” or red). The 2012 release is completely silent on this statistic. Why? No doubt because there are now 18 red schools, up considerably from the 12 listed in 2011. But even that is not the whole story, for of the 12 red schools in 2011, two were closed all together (Rishel and PS1). Of the remaining 10 red schools from 2011, three got a little better — and 11 existing schools were newly added to the red category for 2012. That’s right — DPS essentially doubled the number of schools in the lowest category. So one can understand why this statistic vanished in between annual press releases, for there are 2,065 more students in these lowest category red schools now then a year ago. In fact there are over 3,700 more students in schools in the worst two categories (scores of 40 or lower), and 235 less students in schools in the best category (scores of 80 or higher). Now that should make your head spin. So did DPS make progress in the past year? They sure say they did. Are more students better off than last year? 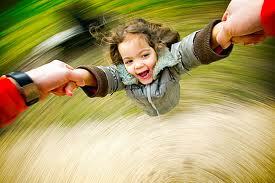 Once you stop spinning the kids, I think the numbers pretty much speak for themselves.